I hate to be boring and talk about the weather (but I’m going to do it anyway). Like seriously, WHERE IS SUMMER?! I think we peaked early here in the UK. I keep seeing people talking on social media about how hot it is where they are and how they can’t turn on their oven and all they can do is eat watermelon and I’m literally sat here in November. I’m putting the oven on to warm up my kitchen! It’s crazy. It can be hard to get in the summer mood but! Summer produce is saving my life. So I’m going to keep eating as many cherries, nectarines, strawberries, sweetcorn, courgettes, etc as I can because no matter how cloudy and grey it may be outside, they still taste incredible. And that is one of the greatest joys of summer. And I’m so grateful for it! It’s been a while since I’ve made a breakfast recipe here on the blog hasn’t it?! That’s mainly because my breakfast lately has mostly consisted of overnight oats topped with sweet summer fruits because why wouldn’t you want to eat as many of those as you possibly could? My go-to fruits this year are cherries and nectarines. In fact, they’re pretty much my go-to every summer. I’d even go as far as saying they’re my favourite fruits?! Yep, I’m pretty confident in that actually! They’re the best. Especially together. 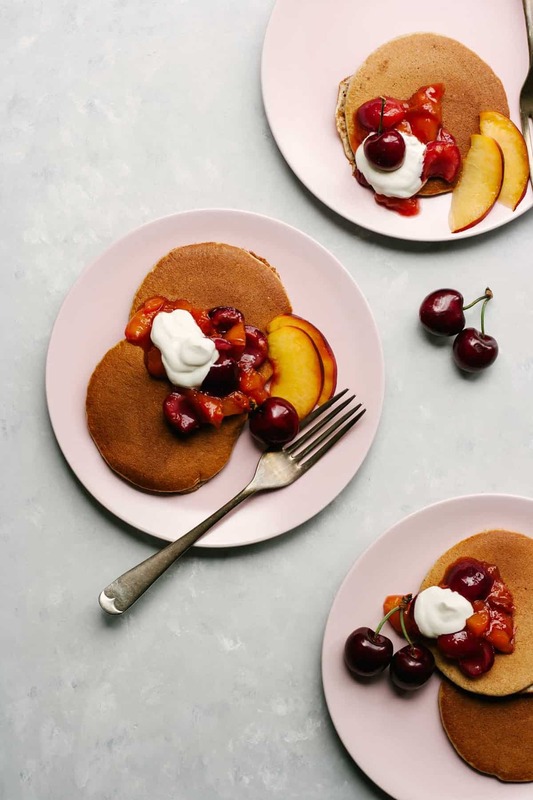 I’ve been making these super fluffy almond butter pancakes a fair bit recently. They’re such a great lazy morning treat breakfast. 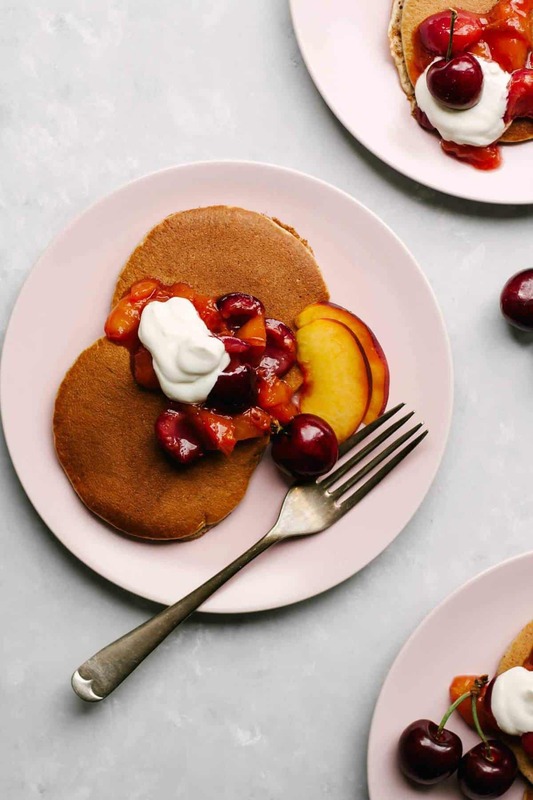 I wouldn’t make them on a regular weekday but for those weekend mornings when you’ve got nowhere to be and all the time in the world to just delight in the process of stirring a few ingredients together to make tender almond butter pancakes – these are perfection. I’m all about delighting in the process. Just this afternoon I got home from work and got straight into the kitchen to start preparing dinner. The simple motion of measuring, chopping, stirring – that’s utter relaxation for me. I love how the fulfillment of such a basic human need can bring such pleasure along with it. And that’s even before the eating! Anyway. 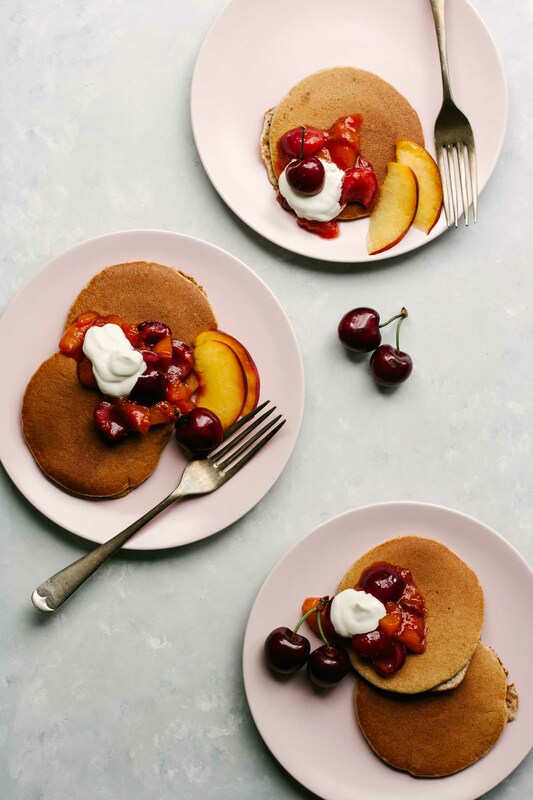 As everyone knows, cherries and almonds just love each other and I’m telling you now, cherries and nectarines love each other too, so this simple cherry nectarine compote is the perfect topping for these little almond butter pancakes. A dollop of yoghurt finishes them off perfectly but you don’t even need that if you don’t want to. As for the pancakes themselves, we’re using almond butter, a little sugar, flour and milk and a couple of eggs, separated and the whites whipped up into clouds which is what makes these so light and fluffy. So easy and so good. 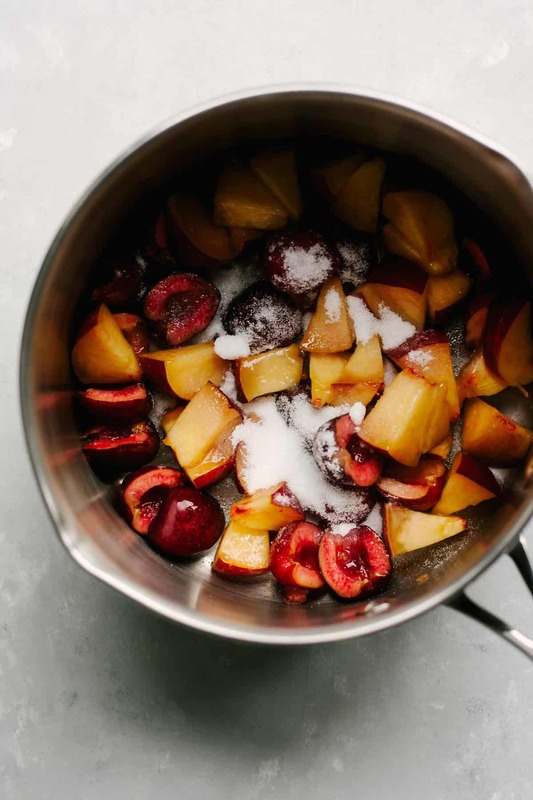 And the compote is even simpler – it’s just a case of simmering the fruits with a touch of sugar until softened. And done. Ooh and I definitely wouldn’t advise against a drizzle of maple syrup, either. That could never be bad. In a large bowl, whisk together the egg yolks, almond butter, sugar, vanilla and milk until smooth. Stir in the flour, baking powder and a pinch of salt until combined. In a separate bowl or stand mixer, whisk the egg whites to stiff peaks. Whisk 1/3 of the egg whites into the pancake batter before gently folding in the rest, taking care to ensure the egg whites are incorporated but that you don't beat all of the air out of them. Heat a crepe pan or regular frying pan over medium-low heat. Once heated, scoop 1/4 cupfuls of the batter into the pan and cook for 1-2 minutes per side until golden. 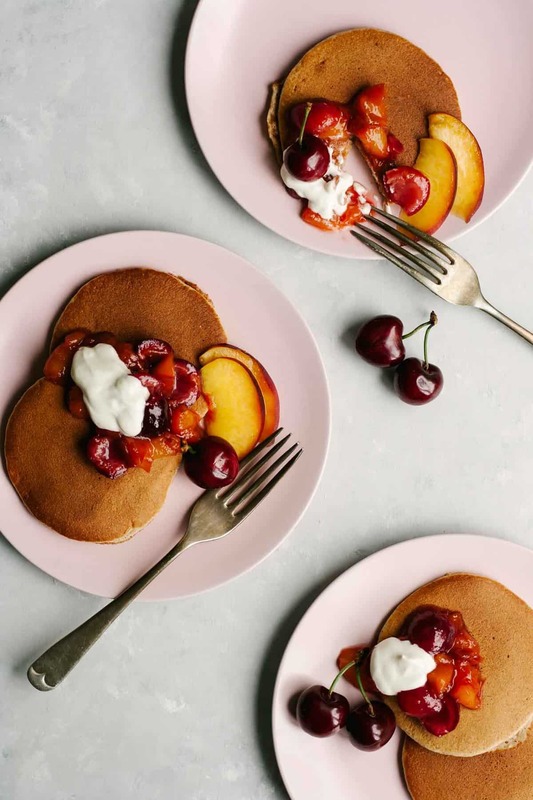 Keep the pancakes warm in a low oven if liked or serve immediately with the compote and yoghurt if desired. Place all of the ingredients into a saucepan and bring to the boil. Turn the heat down and simmer for about 5 minutes until soft and syrupy but the fruit still holds its shape.